Nightly builds have new and better features then the stable releases which are needed. It is better to use nightly build, but check comments in forum if a new, nightly build has bugs, in which case wait for another one. Example zip or 7z file names in bracket changes with various releases. 2) unzip all dll’s : requirement : they need to be in your PATH, most easiest is to unzip both of them into the same directory where you unzipped the nightly, so they reside next to the codeblocks.exe . 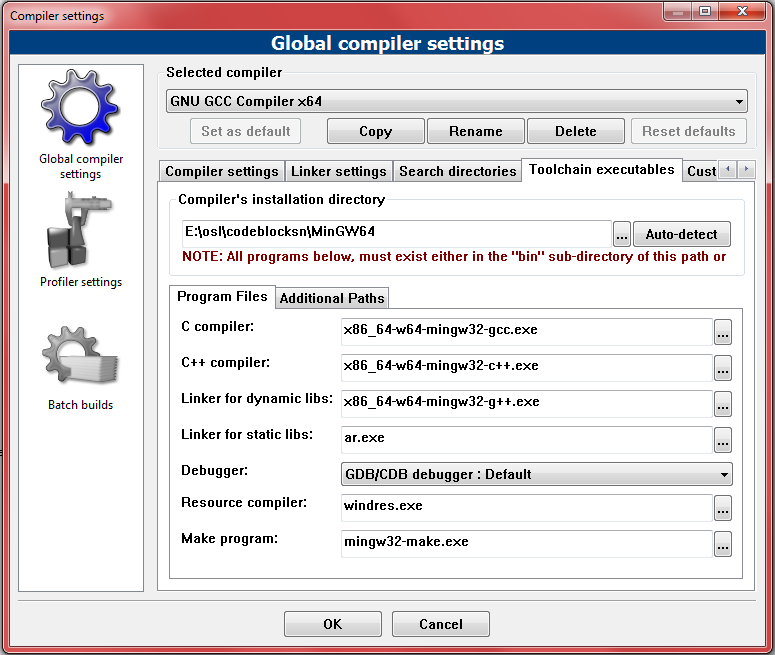 GCC 7 (latest) (GCC for Windows 64 & 32 bits [mingw-w64]) or GCC 6 (stable). Use x86_64-win32-seh (64 bit, SEH exceptions, win32 threads), for using std::threads with it you can use mingw-std-threads (meganz/mingw-std-threads) with it. or you can use x86_64-posix-seh for using pthreads (unix threads) and std:threads built on pthreads but you will need to distribute winpthreads-1.dll with your exe. For example all files inside “x86_64-7.1.0-release-win32-seh-rt_v5-rev2.7z” go to “E:\osl\codeblocksn\codeblocks” folder directly. For example all files inside “CB_20130806_rev9246_win32.7z” go to “E:\osl\codeblocksn\codeblocks” folder directly. 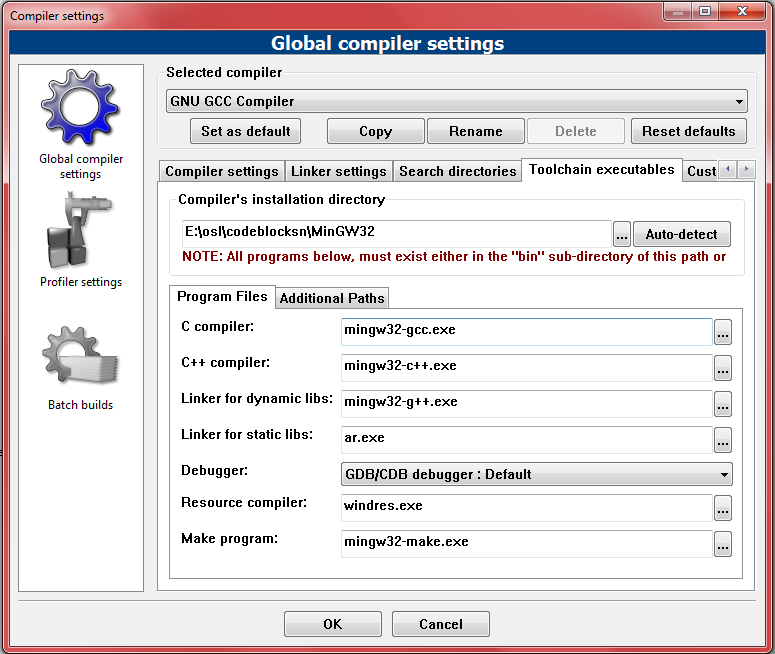 You can even setup clang(Clang – Getting Started) compiler with CodeBlocks. (set these settings) – browse to MinGW64 directory or, just copy the name of executables from this text file and paste in appropriate boxes in settings page. Drag Project Management box in editor to right hand side. or set them manually like above if you selected yes. All projects are saved in default workspace. By this you can save own workspace which is equal to solution file in Visual Studio. Hi ! I really like your blog ! Can you visited my blog and give a feedback or some sugestions ? Yesterday I created them and i don’t know how to make a good blog. I think I need some sugestions. Please help me telling your opinion. Search and read other blogs on wordpress that you like. Find something you know and you think will help others. Then write them on your blog and share its link on appropriate forum so people will know about it. for ex I shared link of codeblocks post on codeblocks forum and links of Unreal Tournament 3 on Epic Forums. Ok, I installed TDM-GCC and its in C:\TDM-GCC-64 foder. How do I enable openmp support? http://gcc.gnu.org/onlinedocs/libgomp/Enabling-OpenMP.html see this link, basically, To activate the OpenMP extensions for C/C++ and Fortran, the compile-time flag -fopenmp must be specified. Search google with “how to enable open mp support in gcc”.